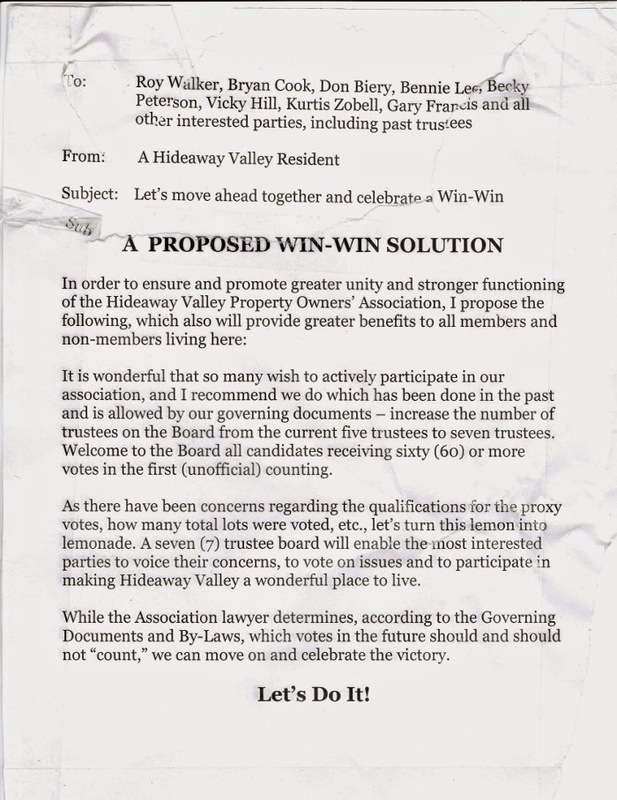 Hideaway Valley Neighbors: Who hired the attorney in the Notice? Who hired the attorney in the Notice? This notice was posted at Hideaway and 4 people emailed it to the Hideaway Neighbors site. We post it here so all members can see what is going on. As such, I want to comment on it. The people who emailed it in all believe they know the person who wrote this--but it is not signed so we will go with "Anonymous." We can say for sure that this is NOT a board action because there has been no board meeting and Trustees cannot take action on their own. The Trustees know that, right? Anonymous proposes that we ensure unity by ignoring our Bylaws. I just don't see how that will help us in Hideaway. He or she wants us to use 7 trustees, instead of 5, and allow the candidates who lost to be on the board anyway. That's so sweet--even if you lose you win! Then next election we will have 7 winners but to make it "fair" we should let the other candidates serve too--so there will be 9. Then the next election it will be the same and we'll have 11! Pretty soon we'll all be on the board! Not a bad idea actually. Trouble is, the Bylaws require that members VOTE on how many board members to have. So no, Anonymous. It is not a good idea. The better idea is to follow our Bylaws. That's the win for everyone. Anonymous calls the first count of vote "unofficial." What planet does Anonymous live on? It was the annual meeting and the count was more than official. Next our Anonymous poster says that there are concerns about the proxy votes. Really? Who was concerned with the 2 proxy votes? That's right. There were only TWO proxy votes--not enough to change anything in the election. Finally, Anonymous writes that the Association Attorney is right now determining "according to the Documents and Bylaws" who will be allowed to vote in Hideaway. I have news for Anonymous. The Attorney is not authorized to determine who can vote. Not only that, the board has to have a board meeting and there has to be a motion and a vote if the attorney is to be hired to do anything. Since there has been no board meeting there can be no board action. Hiring the attorney with member money has to be a board action. So the board could not have hired the attorney to determine who can vote in Hideaway. I expect the board to follow our documents. If Anonymous has hired the attorney, then Anonymous can pay the attorney. But the board better not use my money to pay an attorney that was not hired by a board action. What a great idea! We can let the losers be on the board and the winners, and the gardeners, and the folks in Blackhawk too! This is the best idea ever! What about inviting the Clintons? They seem to like being a part of everything. But wait, let's include the Bushes and the Pauls too. I am so happy to be part of community that would rather include everyone than follow the rules. It's just like living in Middle East. Whoever wrote this did not ask myself, Becky or Kurtis to use our names. We totally do not agree with any of this nonsense! Would love to find out who is behind so we can confront them personally. We welcome you to come support us at the Board Meeting on Monday the 27th at the Senior Center in Fairview! I agree, only the Board has assess to sending anything to the attorney. And the ballots should never leave the Association's control. Copies should be the only thing sent out, but it would be highly questionable whether the out going board has the authority to do this. Not seating the Board after a Member's Meeting is highly unprecedented and shows poor sportsmanship on the part of the outgoing Board. It could be reasonable to charge them personally for this action. May 1st is the start of the fiscal year and is not even mentioned in the same paragraph with election issues in the by-laws. The Board needs to stop stalemating and seat the new Trustees. FYI, Mail boxes are Federal Property. Just a suggestion: Use one of those clips on the new bulletin board next time.